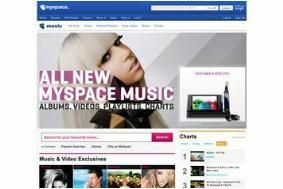 MySpace Music launches in the UK | What Hi-Fi? The site claims it has "the most comprehensive catalogue" on the internet. It has teamed up with Apple iTunes to offer DRM-free MP3 downloading. And it will offer free streaming access to entire back catalogues of artists on major and independent record labels. Like Spotify, advertisements will ocasionally appear on screen, but unlike Spotify they will not interrupt the music which is being streamed.